A generic photo of Littlestone Ammunition 20- and 50-round boxes of ammo. 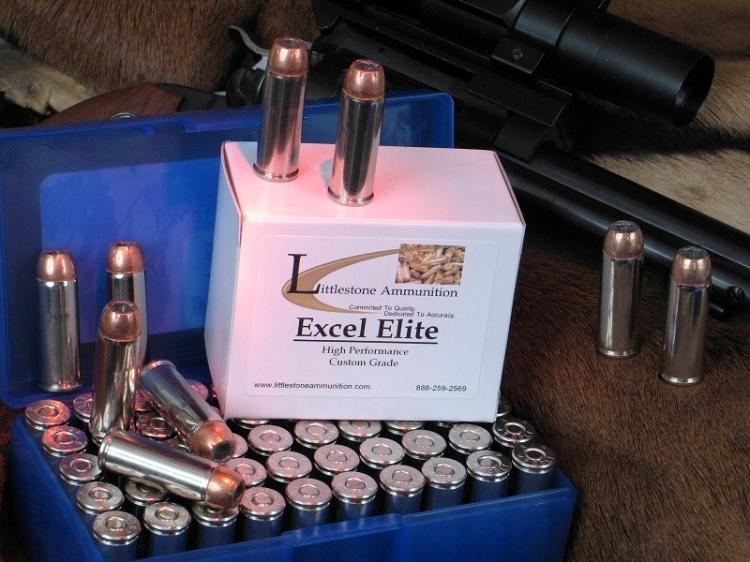 This custom-quality Excel Elite .44 Remington Magnum revolver ammunition from Littlestone Ammunition launches a 200-grain Barnes XPB bullet at 1,400 fps. Accuracy. Power. Super Penetration. Deadly Effect On Target. These are just a few of the outstanding qualities for which Barnes solid copper bullets are renowned. In this loading, they culminate in an excellent hunting round for medium to large game. These hollow point bullets have earned a reputation of virtually 100% weight retention, expansion to about double original width, and extremely deep penetration. Barnes bullets also are well known for their ability to delivery exceptional hydrostatic shock from a wide wound channel and usually deliver complete pass throughs for abundant bleeding. If you want an exceptional hunting loading for your .44 Magnum revolver, this should be at the top of your list. Feature 3: MV / Energy / Barrel: 1,400 fps / 1,022 ft lbs / 7.5"